After about a year we returned to trekking. Cabo–de-Rama, the same place where Hubby had health issues. I watched Girish’s every step and I am sure I was paranoid and normally Girish would have been irritated with me but he indulged me. Put up with all my mothering and dealt with my panic very carefully and most importantly with patience. That is the time I carried these energy bars and we enjoyed them a lot. In fact, I redid them again sometime later but then I had no pumpkin seeds but still, the energy bars were delicious. Baking is something I love and frankly, I am happiest when the cake rises well, when the yeast does its bit of magic or when the aroma of the essence permeates from the kitchen. Ahh! The best times on earth!! 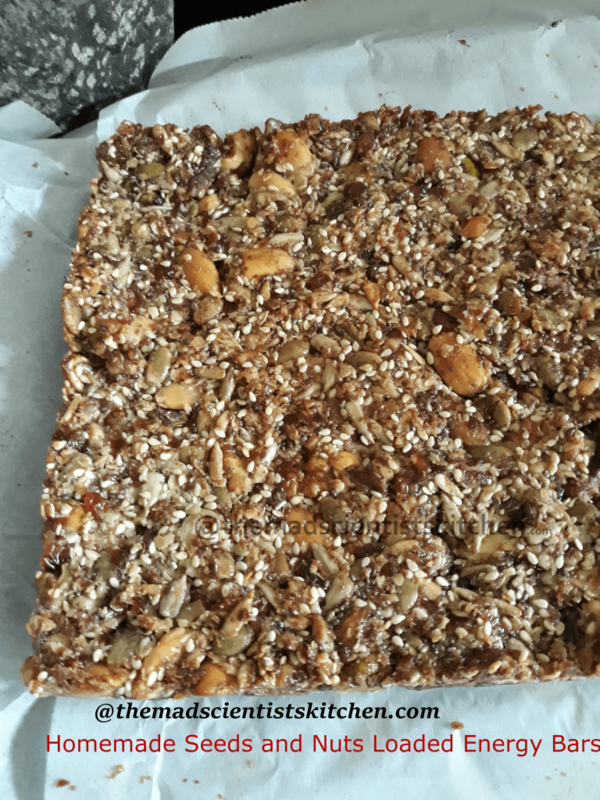 I used to bake oats chikki in the past and think I was the epitome of baking but now I baked with nuts and they seem so much more healthy. Sure enough, I will catch a new fad and will change my bake. 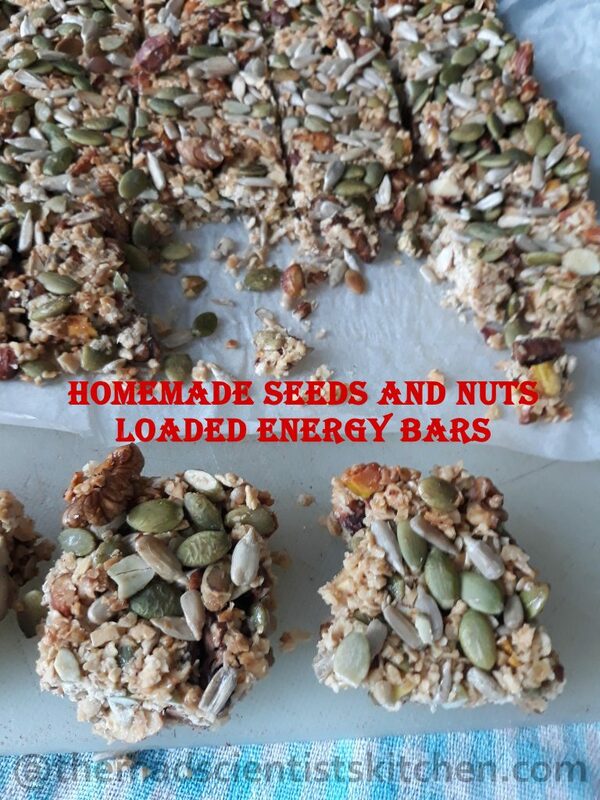 Here are a few of my past bakes in the same lines as these Energy Bars. The reason I am talking about baking is because every year in December Srivalli has a Bake-a-ton where we post 3 times a week any baked item. This is the first time I am participating and since I have had absolutely no plans of joining in my bakes are all random. Any bake I am finding in my backup is being put up absolutely random and last minute. SO don’t be surprised if you find something that makes you wonder just what was that. Hope to replace the pictures later. Preheat oven to 120°C/ 250°F. Grease an 8-inch square baking pan; line the pan with parchment paper extending over 2 edges of the pan. Set aside. Add the cherries, honey, 2 tablespoons coconut oil, salt and vanilla in the food processor. Run the processor until mixture is fairly smooth. In a kadhai/wok put the nuts roast till crunchy. Add the 3 tbsp of coconut oil and maple syrup. Mix well. In a big bowl combine toasted nut mixture and cherry mixture. Work in the cherry mixture in the nuts till well mixed and there are no large chunks left. (Since this is easy if the nuts don’t cool). Transfer mixture to prepared pan and, using a lightly oiled flat bowl or oiled fingers pat mixture firmly to an even layer. Place pan in the oven. Bake for 50-60 minutes or until bars are no longer sticky. Cool in pan, then remove (with parchment paper “handles”) to a cutting board and cut into the desired size. These bars can also be frozen. Just thaw when serving. You can substitute the nuts. You can make thinner bars if you use a bigger tray or like me adjust the quantity in each tray. Poke a toothpick to get the height approximation. Cool in pan, then remove (with parchment paper "handles") to a cutting board and cut into the desired size. How dangerously nutty and delicious those energy bars looks. Prefect to munch when we feel like having something sweet. Healthy and fabulous. 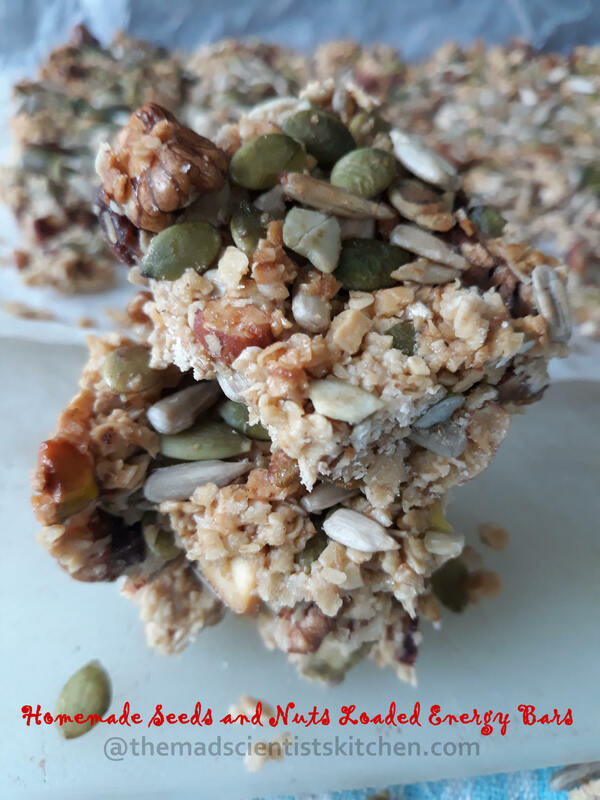 Energy bars are such nutritious treats and perfect to take along on a trek. I love this version loaded with nuts and sees. The bars looks so yum. The bars look perfectly made , loaded ! Yes they definitely are loaded. ! Perfect for trekking , perfect after a workout , perfect for grab and go to office and perfect while you are shopping for long hours ! Loved them to the core ! Excellent share ! Btw can I sue regular oil instead of coconut oil ? By regular oil what do you mean Vaishali? Don’t use some oil that smells. You should be fine. Cabo-de-rama brings back some memories. Beautiful place. This is the perfect snack for hike. Nice one. These bars look so sinful Arch. I would surely bookmark for later…and about the place, its only natural you were like that. But no worries, glad you guys had a good time. 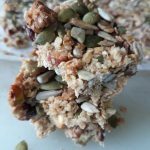 Delicious nut bars that can be enjoyed by everyone!! Perfect for kids snack or something that keeps us energized you whenever feeling tired with daily chores!! 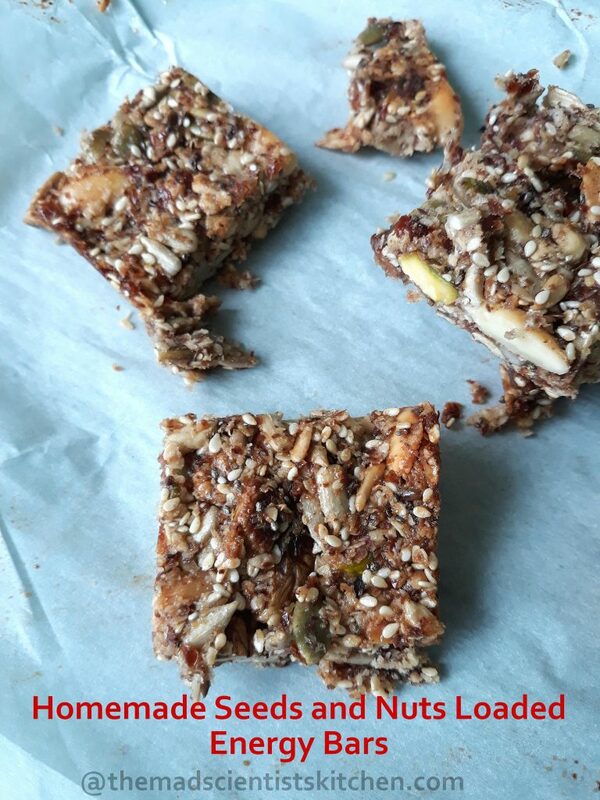 Wow Archana, these bars are packed with so many healthy and delicious ingredients. I would love to try these some time. They sound so nutty and yummy. Great to pack for outdoor adventures. Wow!! That’s loaded with nuts and seeds. And no oats is so good. That is one loaded energy bar Archana! I would love to grab a few bars off the screen. The pics really wants me to try them out so bookmarking it. That is one energy loaded bar!!! Looks healthy and hearty! Each and every bite of it with nuts and delicious honey!! Perfect healthy snack!! !